Note: More info will be added as it becomes available to us. AlQaeda-affiliated terrorists gunned down three more Hazaras in Quetta while critically wounding several others, including at least one non-Hazara. The incident happened at the ‘Qalandar Makan’ on Kasi Road – a Pashtun dominated area on the border of Hazara enclave of Alamdar Road. Eyewitnesses described attackers chanting ‘Long Live Lashkar-e Jhangvi (LEJ)‘ after the attack. Note: We will upload an image of Shaheed Ali Raza once it becomes available to us. Eye-Witness account of attack by Sadiq Hussain, who is among the wounded. We were four (4) and came to Qalandar Makan -mechanic businesses here- to fix our rickshaw. Suddenly we heard chants of ‘Allah-O Akbar’ (God is great). Soon as I looked up, the terrorist opened fire and the first bullet hit me in the mouth area. The target was head (common area they try to hit to ensure a ‘kill’). I started running but the road was manned by the second terrorist, who opened fire at me as he saw me running. I took cover behind people running for safety, hiding behind several people in the crowd, and managed to get out of that road. Three (3) terrorists were running after me and firing at me. I was hit by the second bullet in the leg. As I was getting out of the road, I saw Ashraf Ali (Hazara victim) running towards the scene of the firing (seems he didn’t know the cause of firing at that moment). In that split second, I tried to tell Ashraf don’t go but couldn’t speak as the bullet had hit me in the mouth. The terrorist opened fire on Ashraf and he fell. I managed to run back to Alamdar Road. Terrorists killed Ali Raza (Hazara victim) first. The bullet hit him in the head. After hitting Ali Raza, they came after me and Safar Ali (Hazara victim, succumbed to injuries later). Safar was trying to run but was intercepted by the other terrorist waiting, and opened fire at Safar. The bullets hit him in the face, neck, and back, and he fell. The shop keepers saved two of our colleagues by closing the store shutters and hiding them inside the store (Quetta stores commonly have drop down aluminum shutters). There were four terrorists. Two of them were firing, and two were on guard to protect them. After the first fire, those on guard ran after us. All four were hiding face with a white cloth. 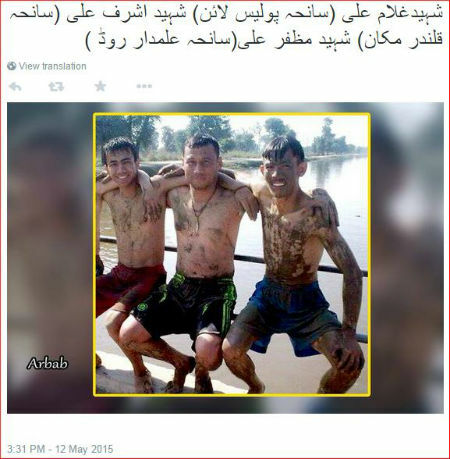 Below – this picture captures the essence of ongoing Hazara genocide (bulk of it in Quetta, Pakistan) in which three friends are killed in three separate terrorist attack. 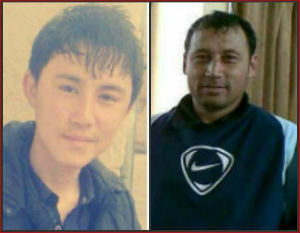 Ashraf Ali – in the middle – was killed in this attack. 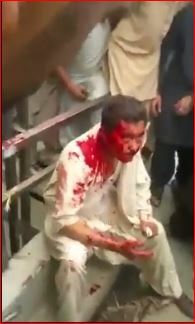 A video released on Facebook shows a very disturbing footage of a helpless Hazara protester (identified as: Raza Hazaristani) surrounded and beaten by a Pashtun mob right in the heart of the Quetta city with no law enforcement agency, or any Pashtun elders, intervening. The mob also sets motorcycle of the Hazara protester on fire. As of this update, the information we received is that Terrorists that killed Hazaras in Pashtun-dominated Kasi Road are free, while the badly-beaten Hazara has been held as a terrorist by the Police at the BijliGhar Thana (police precinct). 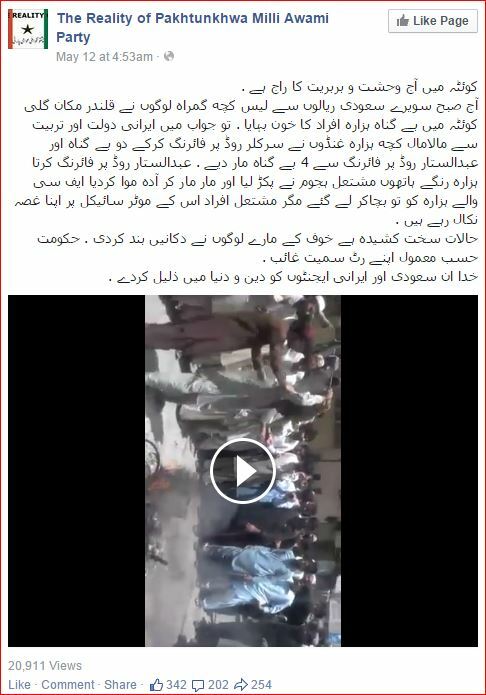 In this below post, a user claiming to be against secular/nationalist Pashtun party, Pashtunkwah Mili Awami Party (PMAP), claims that in response to attack on Hazaras by LEJ, the ‘Hazara terrorists trained by Iran, gunned down two civilians on Circular Road and four on Abdul Sattar Road’ (both roads are within the heart of the business district). We have verified this information to be completely fabricated. No such incident is known to have taken place other than the one in which Hazaras were gunned down by terrorists. There are several other false, and misleading posts by userid’s on Social Media claiming to be Pashtuns with a specific intent to create hatred and misunderstanding between the Pashtun and Hazara community. 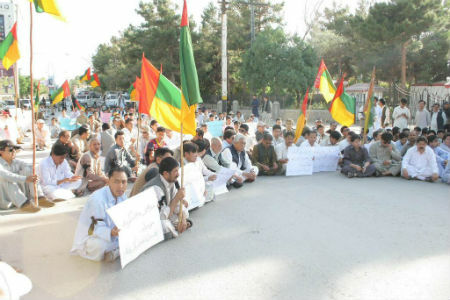 HDP, only political party of Hazaras, held a protest in front of the Balochistan Provincial Assembly to condemn the attack. Video – HDP members peacefully protesting in front of Balochistan State Assembly. Hazaras have a very painful history with the Pashtuns that dates back to 189o’s in Afghanistan – where both have significant majority. During 1890’s, the Pashtun ruler of Afghanistan ethnically cleansed Hazaras (60% killed), sold tens of thousands of captured Hazaras as slaves, and distributed the Hazara lands (Hazarajat) to Pashtuns that took part in the genocide (between 1884-1905) . Most of the Hazaras in Quetta today migrated from Afghanistan during 1890s (Pakistan got independence in 1947; In 1890, Quetta was under India, which was a British colony). 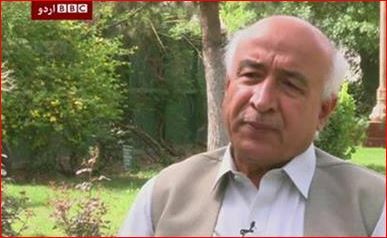 In Pakistan, however, the Hazaras and Pashtuns have worked side-by-side and held mutual respect for each other despite the political upheavals between both communities in restive Afghanistan (Taliban are mostly Pashtuns and carried out several genocides of Hazaras throughout 90’s not unlike their ethnic kin during 1890s). Hazaras and Pashtuns dominate Quetta city (population and businesses). In smaller cities like MuslimBagh and Loralai (Pashtun dominated), the Hazaras have even joined the PMAP party. Under the Musharraf presidency, the current leadership of secular and nationalist HDP worked together with the secular and nationalist PMAP as Nazim/Naib-Nazim (Mayoral type candidacy). In the past few years, however, the PMAP has taken a visibly hostile attitude towards Hazaras. PMAP demands that all Hazaras join PMAP and abandon any political activity and party, such as HDP. Hazaras are wary of such language. In Afghanistan, all Pashtun governments in the last 120+ years have systematically persecuted and marginalized the Hazaras using same language. In addition, the once secular PMAP party seems to be in the midst of a geo-political game and very close to the Pakistani Establishment, as well as AlQaeda’s affiliate, LEJ. 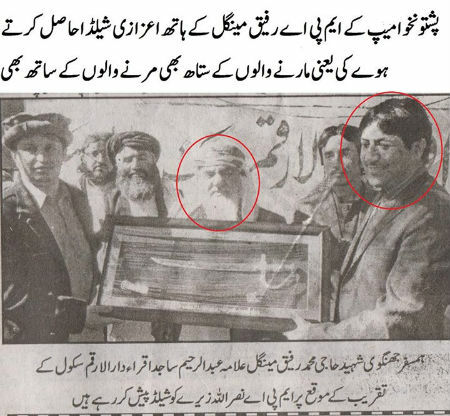 Below image shows PMAP Assembly member, Nasrullah Zeeray, with Ramzan Mengal, Chief of AlQaeda affiliated LEJ, that has owned bulk of 173 attacks on Hazaras. 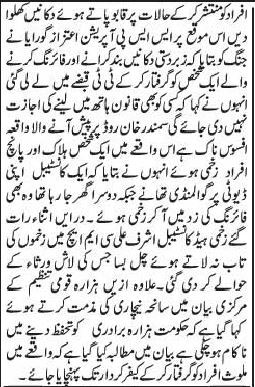 From eye witness testimony, LEJ seems to be behind the Qalandar Makan incident (Note: as of this writing, we don’t have information if any terrorist has owned the attack). There is ample proof that the Pakistani State is fully complicit in the ongoing genocide of Hazaras in Quetta, wider Balochistan, and other parts of Pakistan (Hazaras have been attacked/killed in all four provinces of Pakistan). 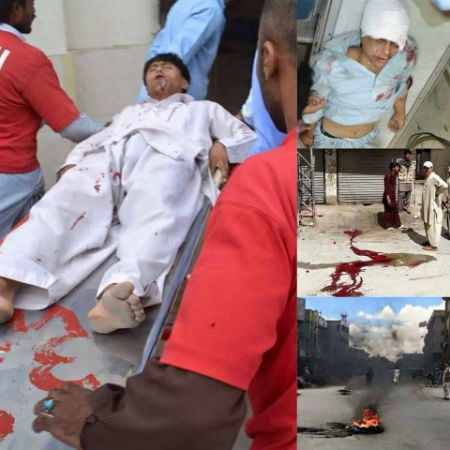 According to Hazara Organization for Peace and Equality (HOPE)—a non-profit organization that documents terrorist attacks on Hazaras—the attack on Qalandar Makan marks the 173rd documented attack on Hazaras by Al-Qaeda affiliated terrorists in Pakistan. Per HOPE, 1500+ Hazaras have been killed, 4000+ injured (many with permanent disabilities), and approximately 100,000 Hazaras forced to migrate to safer shores [ See Google Map of all attack locations ]. 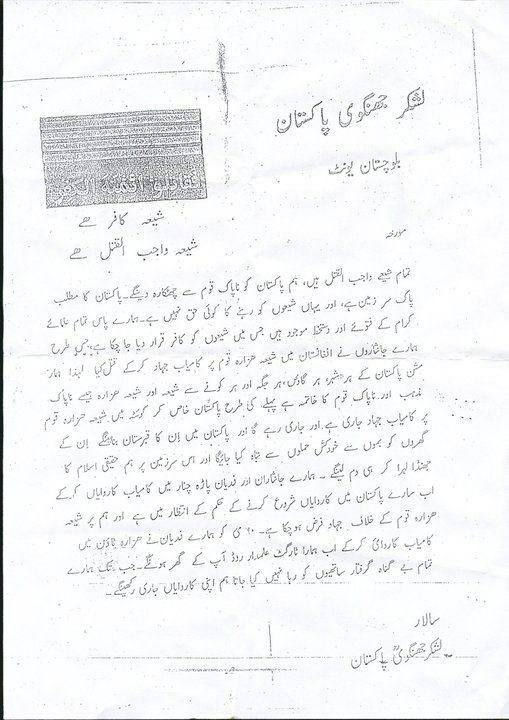 All the attacks have been proudly owned by AlQaeda affiliated groups who have publicly vowed to make Pakistan the ‘graveyard’ of Hazaras [ Profile: Lashkar-e Jhangvi (LEJ) | Pamphlet Ref: ‘Graveyard’ ]. To date, not a single perpetrator has been brought to justice by any Pakistani Government in the last 15 years. In the recent targeted attack on Hazaras at the busy Satellite Bus Station where LEJ gunned down three Hazara passengers, the senior ranking Police Officer (SP Zahoor Afridi) blamed the victims for not getting prior travel permission from Police. Hazaras are the ONLY ethnic group in Pakistan required to seek Government approval before traveling (Note: travelling outside Quetta by road requires government approval, otherwise the Pakistani Government blames the victims for their own deaths. This then, makes it illegal for any public transportation to pick up any Hazara which is clear in the language used by the Police officer. The systematic discrimination notwithstanding, the Pakistani Government has not made it clear how it can handle requests from a community of 700,000 that needs to constantly travel for multitude of reasons, including Government Servants moving within Balochistan for official work, when a mere National ID card approval, that usually takes no more than 10 minutes, takes months without paying huge bribes). It should be noted that the entrances of two Hazara enclaves in Quetta are completely sealed by the paramilitary (FC) forces. Those entering in both areas are stopped, questioned, their id’s checked, and vehicles checked for explosives. The statement of CM is part of a pattern by senior officials of Pakistani Government. “40 people killed in Mastung incident is not such a big deal since Balochistan has population in crores. I will send a truck load of tissues for the victim’s loved ones to wipe their tears. If I were not a politician, I would have sent Tobacco instead”.